Aerial archaeology J. Dassie. Photography. 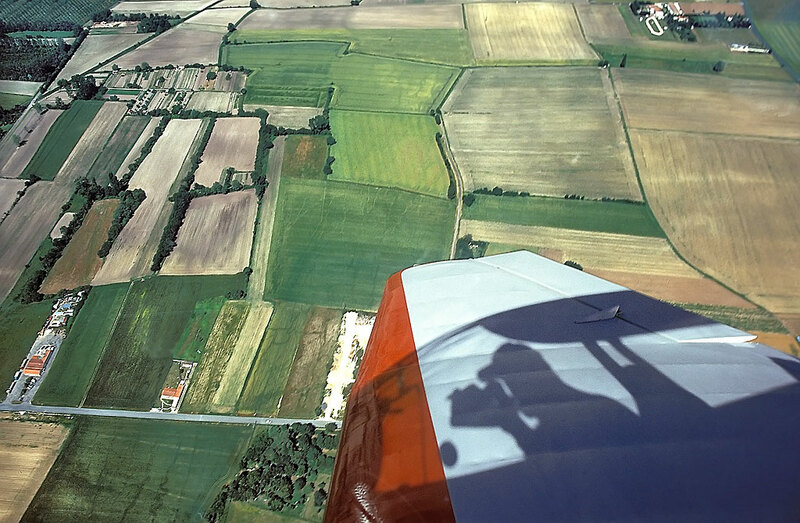 In air archaeology, photography will be used to show in an undeniable way the physical existence of indices detected at the time of discovery of a new site. What are the constraints to which the prospector-photographer will be confronted? Even essentially, the plane must move in the mass of air so that is created the force of lift which, if it is equal to its weight, will maintain it on a horizontal trajectory. The rate of travel is about 50 meters a second (180 km/h) on the majority of the apparatuses of the French private park. And 50 m/s represents a displacement of 0,50 m if the catch of sight is carried out with the 1/100e of second. Of course, relative displacement will be compensated partially by the photographer who will try to maintain the subject centered perfectly in his sight, in spite of, sometimes, incoherent movements (turbulences) of the plane. Conclusions: one will may find it very beneficial to choose a shutter speed highest possible: 1/500e, or more. According to natural illumination available, these speeds will lead to rather large openings of diaphragm, sometimes incompatible with those of our objectives zoom, limited a little from this point of view. Conclusions: use emulsions of at least 400 ISO (ASA) in order to put all the chances on your side. Current emulsions do not present practically any more a grain and there is no disadvantage to use them. Sometimes it is necessary to be wary of the automatic focus of certain modern aparatuses: we had the surprise to have a whole film whose fosusing had been carried out on the plexiglass and not on the subject! Conclusions: always pass the debugging of the automatic apparatuses on " handbook ", to regulate it on the infinite one and - by measurement precaution- block the range ring on infinite position with a piece of adhesive ribbon. Catch of sight in a closed cockpit. And Plexiglass, does one often ask? Presence of a Plexiglass screen decreases the definition of image. Even if the front part cockpit is known as of " optical quality ", one can estimate that the presence of a Plexiglass makes fall the definition from the couple objectif/émulsion to approximately half of its value. But this faded definition is still much higher than the definition necessary to correctly reproduce the transition light/dark from the edge of a ditch. In nature this transition is never accurate and is carried out on a few decimeters, even, a meter. Almost whole of the images presented on this site were taken through cockpit. Aircraft having an opening side trap door. This device equips sometimes some aircrafts. It can be very practical. One can however reproach it a certain exiguity (it is sometimes difficult to aim just through this small opening, when there are turbulences). One will also avoid letting overflow the objective or the sun-shield in the external vein of air: it is often formed a pad of compressed air which, also, comes to degrade the optical quality of the objective. One will not have to, in no case, touch the plexiglass with the objective. Because of the vibrations of the engine, it would be a assured blur. Numerical photography is coming and the question of its use is often asked to us. All salesmen are windy the merits of these technological little marvels. They simply omit to specify that: to obtain comparable images in quality with those of the silver images, it is necessary to approach categories of professional apparatuses whose current prices rise... Out of reach budget for an amateur. Another difficulty resides in the number of high definition images that can be stored in apparatus before unloading. The best hardly arrives at a dozen images, with an expensive memory board flashes.